There is a balcony on the back portion of this house. 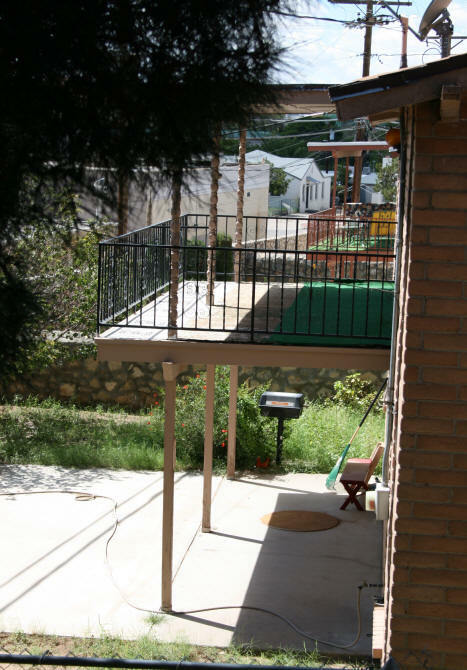 The balcony overlooks our backyard with a "beautiful" view of the back lot of some commercial property. The balcony faces south and you can just see Cuidad Juarez, Mexico off in the distance, between the buildings. The balcony is accessible through either the living room or master bedroom. When we moved in, there was no roof above this balcony. We noticed that the two other houses on the block, that were built the same time our house was, had added a roof to their balconies. For 20 years, the sun and rain did a number on the balcony floor and the two French doors that lead to this balcony. A few years after we moved in, we hired a contractor to replace the wood on the flooring of the balcony and add a roof to shelter it. The roof helped keep the rain and sun off the balcony floor and the French doors. It also now provided a nice shaded area. Fast forward 10 years to 2013. The balcony roof had suffered a few leaks where it met with the main roof of the house. We eventually fixed this. However, there was some damage to the underside of the balcony ceiling. Also, the paint on the beams was undergoing massive paint failure. The wrong paint had been used. Bare wood was exposed in a few areas. I also decided to change the color of paint on the balcony. It had been painted a terra cotta color. Let's just call it orange. I wanted to use the almond color that was on the frames of the vinyl windows we had been installing over the years in our house. 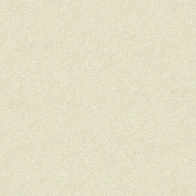 This almond color is actually a light beige khaki. - Strip the remaining paint on wood and repaint. Paint walls of the house under the balcony the new color. - Add moulding between the outside wall of the house and the balcony floor so it looks more finished and to protect it from water damage. - Add moulding on other sections of the balcony roof to make it more finished looking. 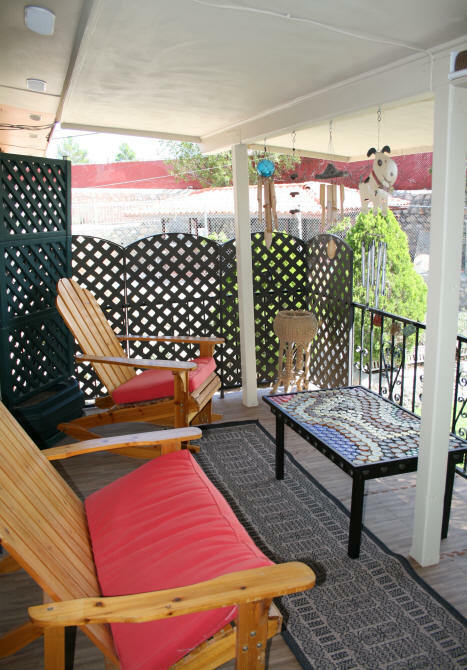 - Get rid of the astroturf on the floor of balcony and find something better for the floor. - Repair all of my broken wind chimes that used to hang on the beams. - Put a couple of coats of polyurethane on the Adirondack furniture. The clear finish on the wood was wearing off. It only needed a couple coats of clear paint to make them look new again. 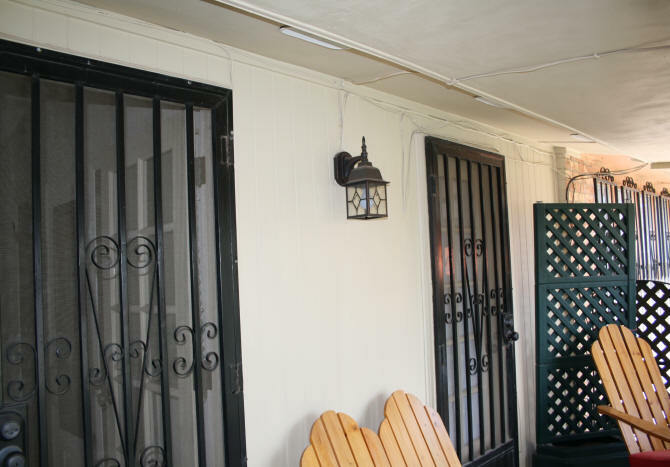 - Paint the two French doors the new colors after stripping and repairing the wood. Again, this was a project where I did not take any before pictures. My apologies. However, you can see what the astroturf, balconies look like by looking at the neighbors' balconies. Don't even get me started on the weeds next door! These people are the laziest, ever! 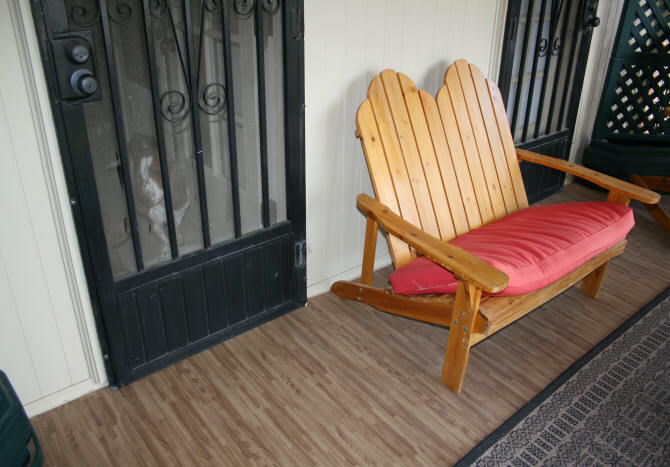 While I still had the old astroturf on my balcony, I painted the Adirondack furniture. This way I did not have to deal with a drop cloth. The balcony was also used to store the toilet while the master bath was being worked on. It also gave me a chance to clean the toilet upside down before it was reinstalled. The astroturf was good for all of this since I knew I would be ripping it out. Since I do not have the before pictures, I will show you the after pictures and explain what I did. The photo at the left shows the finished balcony. The beams and ceiling were all stripped of the peeling paint. The wood beams sanded and filled where there were knots in the wood. Moulding was added underneath the cross beam. The cross beam is actually two pieces of wood next to each other. I wanted the beam to look like one piece of wood. I found some moulding that fit underneath this wood exactly. The wind chimes are attached here. All of the moulding that was already on and added was then caulked. The beams and ceiling were first primed with an oil based exterior primer from Sherwin Williams. The final paint that was used was a custom mixed color to match the vinyl color on our windows. The brand I used was Sherwin Williams Duration. 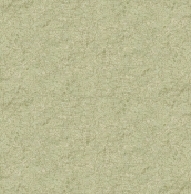 I really like this paint. It goes on smooth. It is not cheap, but I bought it on sale. I also painted underneath the roof and replaced the oval roof vents in this section. You can see in the upper left corner the orange part of the roof eave that has not been painted yet. I will have to rent a scaffold to paint this. 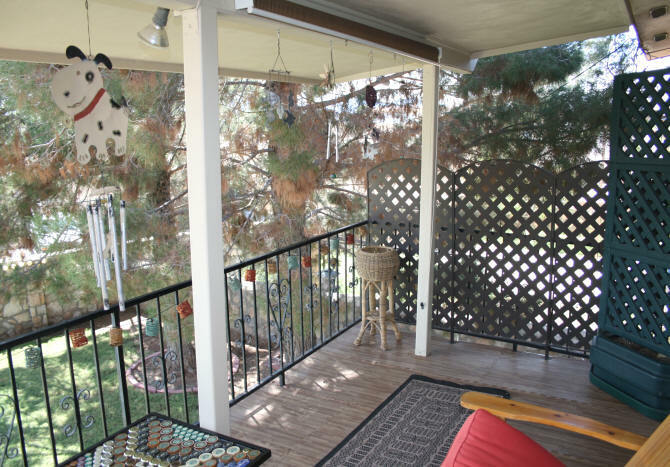 The bronzed metal privacy screens on the side of the balcony were not new. I purchased them on the Improvements website. We have had these for a few years. They provide privacy from the neighbors houses on both sides. They are attached to the wrought iron railing with zip ties. They have stood up pretty well and do not have any signs of rust yet. Even the one section I have attached to a gate outside in the yard. All of the wind chimes had been damaged over the years with strings that had broken. I actually kept all of the parts. I spent a couple of days restringing and gluing pieces on until they were all repaired. The pull down blind you see attached to the beam in the above picture was also something we bought years ago. It provides privacy for the bedroom if the door is open. You can open the door of the bedroom for fresh air, lower the screen and not have to worry about people seeing in the bedroom from the commercial lot behind the house. The moulding against the bottom of the wall is new. 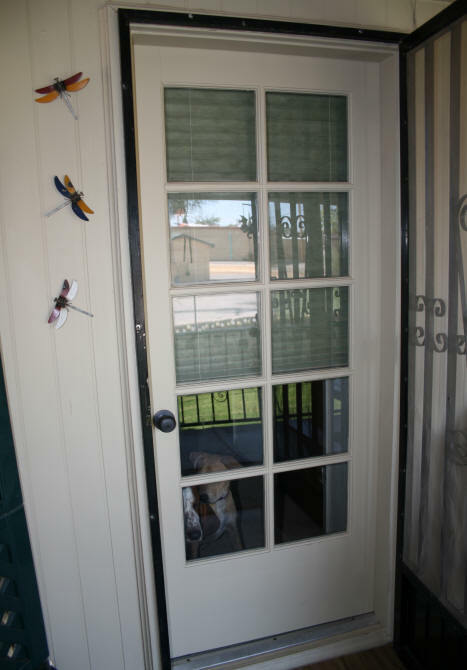 Shown in the above photograph with our Basset Hound, Griffin looking out of the screen door. There was actually a large gap between the wall and floor that collected pine needles, dust, and water if the floor was hosed down. I placed a large amount of silicone in this crack and then nailed the moulding on, applying more silicone to seal it off. A new light fixture was added that matches the light fixture below on the backyard patio. All of the cables were painted. There are multiple cables out here for the internet/tv cable and the satellite. The one thing I did not originally plan to do, was add a table. But it made sense. The only place you had, to set down a glass, were the arms of the loveseat. For over 10 years I had been collecting bottle caps. I did not know what I would do with them, I just kept collecting them. I then came up with the idea to create a table top with them. This idea is not new and you can find many others like it on the internet. 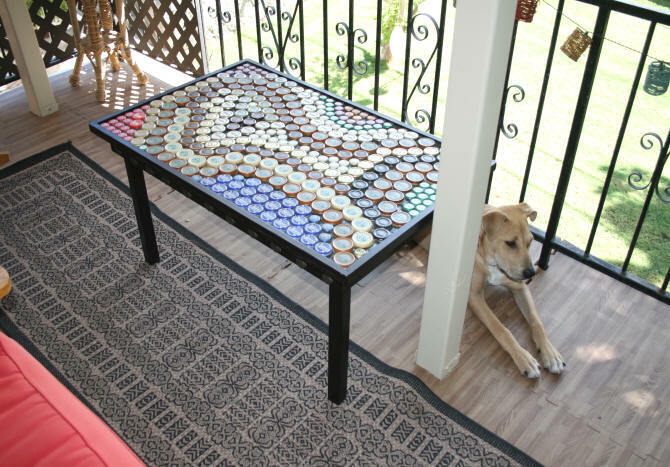 Adopted shelter puppy Roxie helps model the table in the above photograph. I needed to make the table. First I created the design with the bottle caps on the kitchen counter. I needed to know how large of a surface I would need, which was based on how many bottle caps I had. I determined that I would need a piece of wood about 2' x 3'. I bought a piece of project wood at the hardware store and cut it down to 24" x 37 1/2". The legs of the table were from some scrap 2" x 2's" I had sitting around. I bought some 1" moulding for the edges. I used scrap wood I had on hand for the sides of the table. After constructing the table, I painted it with Rust-Oleum Painter's Touch Metallic Paint in Oil-Rubbed Bronze. It was primed first with the primer they suggest using. I spray painted some of the small bottle caps with Rust-Oleum Hammered Brown. I glued the spray painted caps around the sides of the table for decoration. The bottle tops for the top of the table were glued on the table top between the moulding that I placed around the edges..
At this point you are supposed to poor resin on top of the caps to encapsulate the bottle caps. I did not do this at the time. The resin I discovered, is not cheap. What I had on hand is a gallon of polyurethane that was drying up. I lathered on the paint. Making sure it seeped in all of the cracks. I stopped at 5 coats. Letting it dry for several days in between coats. I may go back later and add the resin. In the meantime, it is protected from the elements and is easy to clean with a hose or cloth. The little basket lanterns strung along the wrought iron are some solar lights I added. Yes, all of the planters are empty right now. Next year I will add some plants. The astroturf took a while to remove. There were two layers of it. In fifteen years we had replaced it three times. Astroturf does not last long in a desert region like El Paso. It just starts to disintegrate before your eyes after a couple of years. It was also hard to clean after the numerous dust storms we have every spring. We had it nailed down good and then we had metal flashing on the edges to keep the edges from fraying. I will never....ever....use astroturf on anything again!! What did I use instead? First I measured the area to see what my dimensions were. The measurements of the balcony floor were 16' x 8'. I first looked for an outdoor rug that would fit within these dimensions. I thought about rubber tiles like the ones I have used on my front entrance. I wanted something that could handle the heat and could be cleaned easily after a dust storm. I finally came across a foam floor tile on the GreatMats website. These particular foam tiles were 5/8" thick and were reversible. Wood grain on one side and a terracotta color on the other side. 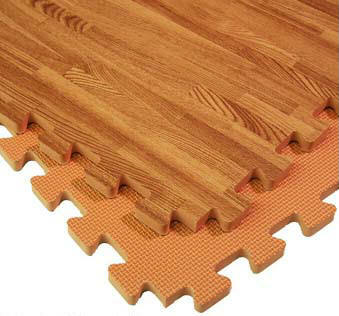 GreatMats also has a less expensive wood grain foam mat that is 1/2" thick. I decided to go with the more expensive mat because it was thicker. I also liked the idea of it being reversible. When the wood grain fades over time, I can then flip it over. I also liked the edges. The edges were the terracotta color that matches the bricks outside the house. I did not like the white edges on the thinner mats because you would be able to see it when you looked up at the balcony from the backyard. Even though the reversible foam costs more, it was like getting two mats for the price of one to me. The mats are two feet square, so I only needed to purchase 32 tiles for my balcony. I really do like them. I have had them in place for a few months now and they appear to be holding up. They can be swept and mopped easily. There is a little bit of curling up at the edges, but not much. You can see the seams a little in the photographs above. Because they are foam, there is a nice cushion when you walk on them. However, they will show dents from furniture that do not come out. So it is best to place your furniture in one spot and don't move it. Dog toe nails will poke little holes in them also. The privacy screens and furniture are helping to hold the foam pieces in place. I installed the flooring after our windy season. I will have to wait until the spring to see if the winds work any tiles loose. I kept the spare end pieces that you remove when you piece it together. So if an edge piece falls off and gets chewed up by the dogs, I have extras. The rug runner that I have on the floor is an outdoor rug I bought a few years ago. If it gets dirty, all I have to do is hose it down. Yes, the rug does blow around a bit if it is real windy. Which is why the table is on top of it. I still need to paint the screen doors and the wrought iron. I will do this when I replace the torn screen on the bedroom screen door. The French doors were removed and repaired. The doors are part of my overall door project. Each door took about two weeks to fix. The solid wood doors were still structurally sound. None of the glass was broken and all of the moulding between the glass was still there. However, these doors took a couple of decades of punishment from the sun and rain before the balcony roof was installed. The paint was peeling and there was water damage. The inside paint was also discolored and needed to be painted. The doors were taken off the hinges and placed flat on work horses. The stripping of the paint took a while. All of my previous strip and paint projects were done using metal scrappers and sandpaper. I was having a hard time getting the paint off around the glass. I decided to try out a chemical stripper to at least soften the paint so I could get it off easier. 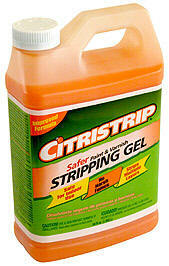 I did a little research on paint strippers and came across Citristrip which is more environmentally safer than the older strippers. It does work. The key is to put a lot on. Do your scrapping while the product is still damp. It will work better on latex paint than oil paint. I also had to apply and scrape a few times in some areas. The odor it has is a light orangey smell, but you get used to it. I did this work in the middle of the living room and the odor was not overpowering. After the paint was removed, the doors were sanded down to fresh wood. I had to use a power sander for this. I used wood filler to help smooth out areas that were a little warped and then sanded again to make the surface flat and smooth. The doors were then given two coats of oil primer and then two coats of latex paint. A couple of weeks after the paint had cured on the door, I sealed the windows panes on the outside with clear silicone to keep any water from getting between the wood and the glass. What was my next project?